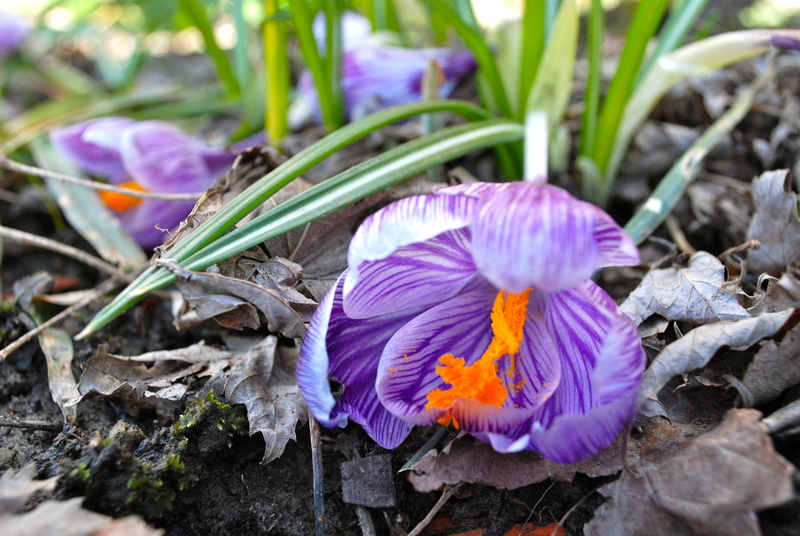 crocuses peeking out, the first of the season. Last week, my boss and I traveled to Saratoga Springs for the New York Press Association conference. From Buffalo, Saratoga is about 300 miles down I-90, a straight shot through brown-on-brown furrowed brow fields, trees like crinkled brown pipe cleaners and rolling hills the color of wet sand. “I wish the trees would bud,” we’d say to each other, every half hour or so. We talked about Spring like a guest whose arrival we awaited. Because she is, in a way. Even with sun kissing the ground, expanses of dry grass looked like defeat. Like Winter had bombed out the world and we were the only living remnants of this post-apocalyptic residue. This week, Spring leapt onto the Earth like I think a lion cub might, all playful surprise and open-mouthed joy. I first noticed it driving to work yesterday, after one day of sun and two of a percussive rain. The grass glowed with that Pantone emerald we distrust in paintings. The kind of color spreading across the landscape that looks oversaturated in newspapers, the kind of brightness we crave in excess, like we do all rich things. I don’t love the gloomy skies these rainstorms bring, but the flowers beneath them open in my chest as much as the ground. When it rains like this, and the plants begin to dance in the breeze like the newborn revelers they are, I crouch low to the garden and breathe in the musky smell of the dirt that crumbles in my fingers, sticky and vital. It smells like manure and blood and iron and all of the things that make us life, because it is. When I smell that Earth, I understand why people talk about weather. It’s in us, as deeply as our breath is in us. Next Responsible reporting in the age of social media: where does the line lie? Paragraph four is brilliant. You’ve managed to undo an overdone topic and set it alight again. Excellent work.